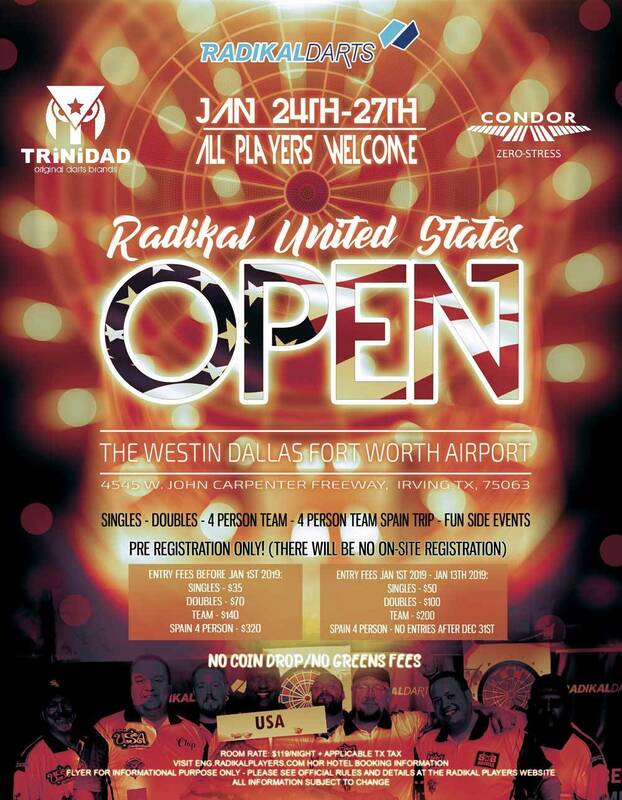 Room Rate: $119/night + applicable TX tax - To book your rooms with the promotional room rate please use this link: http://bit.ly/2C4FOaB or you can call the hotel and use the Group ID "Gaelco Darts USA"
Group rate is availble until Jan 2nd or until sold out! Exclusive incentives and VIP party for those players staying at the Westin. Be sure to book your room ASAP! -Thursday Night Blind Draw - Seperate Mens and WOmens Brackets - Sponsored by the USDC - $500 Added Money each! Operator of the winning team will also receive flight and hotel to Spain for 1 person. The operator will be responsible for registering the team in the event. Players must have rating and games on their ID before Jan1st 2019. Dec 31st, 2018 will be the last day to register for Spain trip event. After registering for events - login to your player account and double check the events you registered for in the "My Competitions to Start" section. If you do not see youself in an event you are not in yet. Players are responsible for double checking their entries. No Registrations after Jan 13th 2019!